SecuLore Solutions monthly newsletter features Public Safety focused news, cyber tips, webinar topics, and upcoming events. Petersburg, VA: Public Safety communication centers for Petersburg and Richmond were impacted by an influx of calls from southern states after a hacker attempted a TDoS attack by linking a teller marketing group's phone number to the local 9-1-1 system. As you celebrate Thanksgiving & Black Friday, be extra vigilant when you read emails & click on links. Hackers like to take advantage of this time of year by sending phishing scams that look like order confirmations, tracking info, & alerts you might be expecting. Have You Visited Our Cyber Attack Archive? In the last 24 months we have recorded over 300 publicly reported cyber attacks targeting public safety and local governments. See the attacks impacting your state and check for updates every week! West Safety Services & SecuLore Solutions announce sales partnership to provide 911 with cybersecurity services. Our social media pages are dedicated to Cybersecurity issues currently impacting Public Safety. We'll keep you up to date on the latest stories, news and tips for 9-1-1. 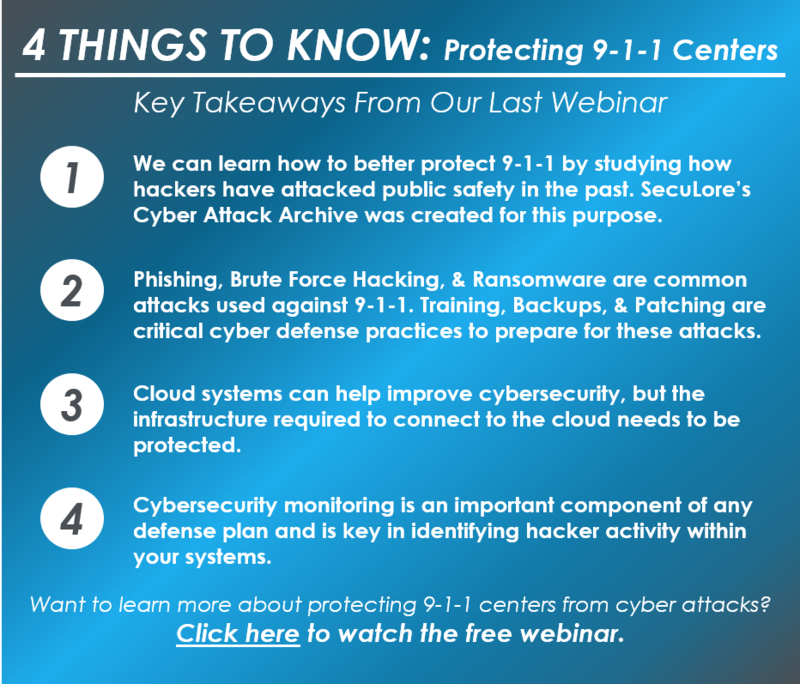 You received this email because you are subscribed to 9-1-1 Cyber News from SecuLore Solutions, LLC.